It takes a lot to inspire dedication – people have to care very deeply about something to be dedicated to it. Apple ][ aficionados are by no means the only dedicated species on this planet: car enthusiasts, Raspberry Pi tinkerers, painters on art tours – we all share a degree of passion which outsiders often view askance…while being so dedicated to their own “thing” such as a football team, a TV show, or a favourite restaurant. But today, I was reminded of just how dedicated my fellow redo-computer enthusiasts were, in a few (very) different ways. Firstly, there was an e-mail from Ken Gagne, the Editor-In-Chief and Publisher of Juiced.GS, the world’s only remaining (and longest running) Apple ][ print magazine. [Disclaimer: Ken kindly commissioned a story for the June ’16 issue of Juiced.GS on WOzFest from me.] To continue sourcing material for and publishing Juiced.GS takes a special kind of dedication. I burned out after only a few years of co-editing the Club Mac magazine, MACinations – Ken has been Editor-In-Chief of Juiced.GS since 2006! And, it seems, he has no intention of stopping – what an effort! Secondly, Jeremy, an attendee of WOzFest /// posted his gallery of photos from the event on the WOzFest /// Galleries post I finally got around to putting up. Jeremy drove up for WOzFest /// from Canberra, a 6-hour round trip. And Jason and Geoff flew up from Melbourne to attend – it takes a certain kind of dedication (or crazy) to go so far for what is, in effect, a one-night informal gathering of Apple ][ collectors – what an effort! And lastly (for now), there’s Steve Chamberlin, of Big Mess o’ Wires. I’d been following Steve’s travails around sourcing/reproducing DB19 connectors for his most excellent Floppy Emu disk drive emulator for many retro-Apple computers. It turns out, Steve has bitten the bullet and organised manufacture of 10,000 (yes, 10,000!) DB19 connectors to supply not just his own needs, but (as a group purchase) the needs of other retro-enthusiasts, including Atari and NeXT enthusiasts. 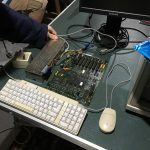 Steve had already gone above and beyond in extending his Floppy Emu beyond its original scope of being an early Macintosh floppy drive emulator. It now emulates pretty well any Apple drive designed to use the DB19 connector, including SmartPort drives, the Macintosh (non-SCSI) HD20, Apple ][ drives and Lisa drives. Steve could have quite rightly rested on his laurels and said, “No more DB19? No more Floppy Emus!”. Instead, he took the bull by the horns and solved his own supply issue and that of other enthusiasts – what an effort! With dedication like the above, there are many exciting days ahead for us Apple ][ collectors! Here are my pictures from WOzFest /// – feel free to post links to your own galleries in the comments!